I’ve written quite a bit on audiovision over the years. If there is a determining principle that guides my angle on aural perception, my choice in media subjects, my thrust in critical discourse, it would be that audiovisuality is a given state. No sight exists without physical, psychoacoustic, imaginary or cultural simultaneity in sound. The inverse is equally so: no matter how pure or essentialist one’s desire for ‘sound alone,’ the colour of your shirt will always betray an ulterior motive to your sound-making. The beauty of audiovision, then, is how inevitable its eventfulness becomes, and how overwhelming the sensation of sound and image merging can be in the present moment of experience. Furthermore, this invisible inevitability has yet to be excluded from critical writing on visual things presumed to be silent, sonic things presumed to be beyond image, and all the chaotic attempts to either neutralise or radicalise the relationships between opto-cine-theatrical languages and sono-musical languages. My task in writing on audiovisuality is to discern and navigate those moments where things happen in ways more maximising and problematising than perceived wisdoms would like and avant-garde gestures would claim. Within avant-garde practices, audiovision has been consistently pursued as if it can unlock the divisive channels of linguistic discourses and/or medium-based protocols. This collective dream is reiterated as a type of mystical synaesthesia, wherein all sono-musical events exist only because of their visual prompting, and all optical-visual occurrences exist only because of their aural triggering. Maybe, this would be okay if interesting and unexpected things happened in the rigging of systems (faux-mystical, performative, pseudo-scientific, technological, theatrical etc) so that the aural and ocular planes could generate an X-factor beyond one’s conceptions of how the two could co-exist. But this never happens. And the more artists attempt to authorially engineer this through the above-mentioned systems, the more they over-determine their outcomes to contradict the push to expansiveness to which their composition is logically aligned. Speak Percussion’s recent Fluorophone concert exemplifies this dilemma. In many respects, Speak Percussion synchronises to the contemporary state of avant-garde musical mechanics, where the act of ‘sounding’ is derived ostensibly from the audible gesture actuated by ‘touching.’ Percussion instruments have long been relegated to the roles of chronometry, accentuation and enhancement within the orchestral machine’s academic hierarchy. Thankfully, the 20th century witnessed an amazing destabilisation of this vertical stigmatisation, as numerous notable composers foregrounded percussionists as logical explorers and sonic cartographers of how ‘sounding’ in post-melodic, atonal or meta-harmonic realms could best be navigated. This legacy is heard today in the works of just about every exploratory musician interested in prepared instrumentation and frequency interpolation, who must consider their attack, sustain, decay and release as singular self-contained events—just how a percussionist strikes their instrument of choice. Indeed, the state of music now in so many ways can be interpreted as a paradigmatic shift into or onto the percussive plane, as if we are now inhabiting an expanded temporal realm where a single strike of a timpani becomes a symphonic movement, time-stretched to reveal the complex minutiae of what previously was presumed to be a transitory blip on the score. 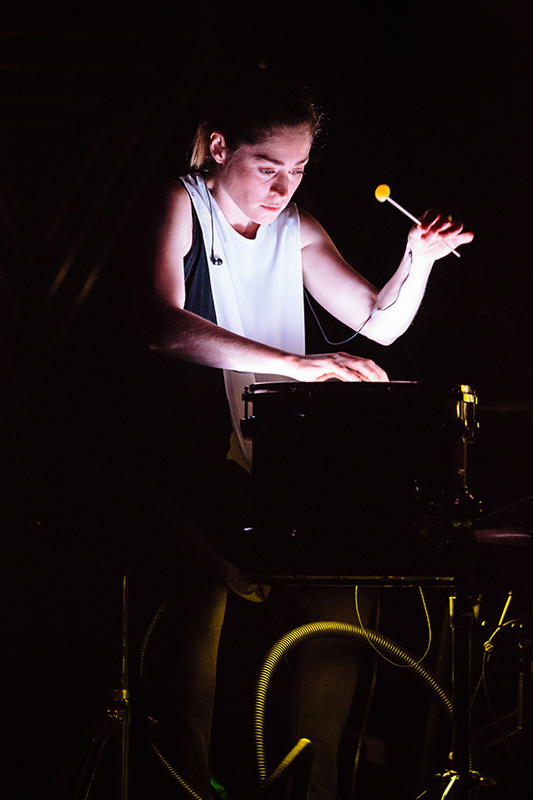 Speak Percussion have carved pathways upon this plateau, forwarding a range of highly professional and often engaging compositional and performative considerations of how percussiveness generates these maximalising sonic events. 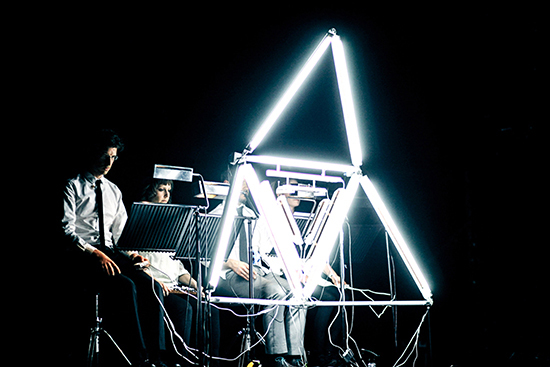 The Fluorophone concert arguably exists on another plane. In its intention to embrace a technologically mediated incorporation of visual contraptions into the musical performance, Speak Percussion have dislodged the maximising centrality of sonic eventfulness that their less visually/theatrically preoccupied performances have generated. Two key pieces by members Damien Ricketson and Eugene Ughetti demonstrate this. 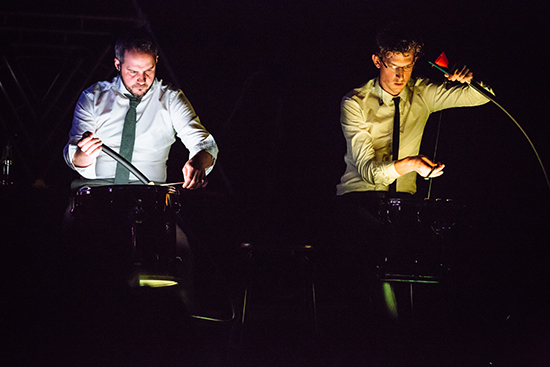 Ricketson’s Rendition (2016) is performed by two percussionists punching strobe flashes whose actioning is further modified by a third performer. The result is a changing grid of literal clicks, synchronised pulsations and triggered envelopes of tone. The piece deftly moves through a series of micro-movements as the two performers on a raised stage face each other or turn away, sometimes operating the light switches, at other times performing handheld or hand-swung percussion instruments. Watching its staging, one can enjoy the stroboscopic effect of the performers’ bodies suddenly appearing in tight synch to their ‘sounding,’ or generating a Muybridge-like stop-motion effect with their swinging arms as they sustain their ‘sounding’. But is this truly interesting? Or is this the type of window-dressing that theatre and lighting directors now routinely impose on musical performers? Ughetti’s Pyrite Gland attempts a playful experiment in converting three tom-tom drums into light-emitting screens which respond to sensors registering a range of vibrations brought to bear on their skins via direct attack and various mediated pressures (from foot pumps, ribbed tubes etc). Again, the performative staging overwhelms the sound-making, transforming the performers into whimsical faux-nerd game-players with absurdist contraptions. Their skills are foregrounded in the circus-like arena of their synaesthetic operation. Both works paled when audited with closed eyes: they sounded over-composed and over-read. Their visuals equally smacked of the cursed ‘droll wit’ which classical performances often extol as a sign of their refusal of concert hall propriety. And finally, their synchronism cancelled out audiovisual complexity, transducing the works’ eventfulness into mimetic charades of their ontological base. ‘Sounding’ has been promoted in a variety of performance events in the last five years. Sometimes it has been well-considered and fruitful: the integrated audiovision of Zoe Scoglio; the unsettling inter-scoring of the Bolt Ensemble with the Amplified Elephants; the anarchic art-music partying of Slave Pianos. More often, it has been theatrically laboured and sonically withering (Kate McIntosh’s All Ears (see a Vimeo trailer); Matthew Sleeth’s A Drone Opera (read Andrew Fuhrmann’s review); Ashley Dyer’s Tremors). Contrary to how this might sound, I’m not the cynical one here. The current climate which mandates that all arts should somehow be interconnected and/or relate to ‘the world’ legislates these types of intermedial events and happenings. Hyper-synchronism and authored-synaesthesia might be historically grounded in mixed/multi-media experiments from Cage to Stockhausen, but their contemporaneity betrays their being bound to the dream of making relative/relational art. Fluorophone symptomatically reflected how contemporary theatre has subsumed those intermedial experiments into a utopian multi-sensory façade. For many people—indeed, maybe everyone but me—this is a welcome transition. I don’t hear it that way at all. See Madeline Roycroft’s review of Fluorophone.